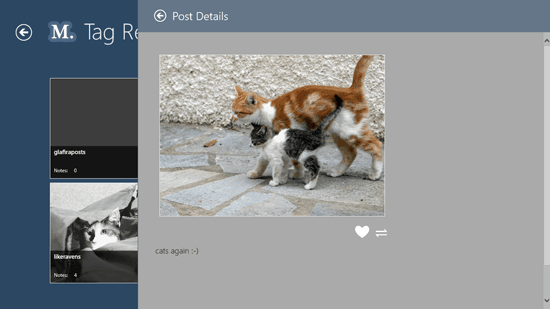 Metromblr is a free Tumblr client app that is developed to be used on Windows 8 and 8.1 computer. It is different from other Tumblr client apps as it is fully loaded with different important features of Tumblr. The interface of Metromblr is similar to how Tumblr looks like. It has blue background with popular posts showing up on the homepage of the app. When you right click on the homepage of Metromblr, you will see a Sign in button on the bottom right of the page. Sign in to your Tumblr account for a personalized experience on the Tumblr client app. To sign in to the Metromblr app, you will have to log in with your Tumblr account details and allow the app to access your data and make posts on behalf of you. The app shows you your dashboard after you sign in. 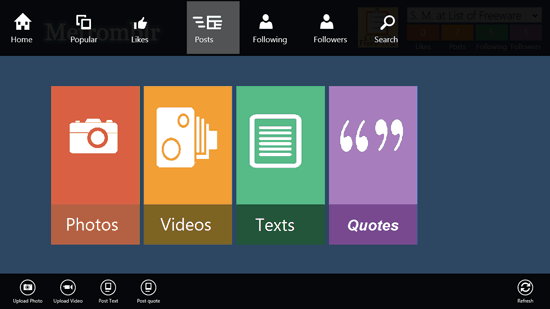 There are big vertical tiles for Photos, Videos, Texts and Quotes in the center of the screen. On top right side you have your account name with likes, posts, following and followers. On right clicking anywhere on the screen of the dashboard, you will see many options on top and bottom of the screen including home, popular, likes, posts, following, followers, search, upload photo, upload video, post text, post quote and refresh. In the app you can search and browse different posts by different people, the people you follow, share the posts, like the posts and do so much more things. You can also see who you are following or who are your followers in a much more simplified manner of blocks where the highlighted alphabets show that your followers or the people you are following fall in those alphabets. In the app you can search for posts or photographs using the search tab.